ROLEX POCKET WATCH ENAMEL DIAL GOLD-PLATED Rolex. Case No. 294344. Made circa 1935. 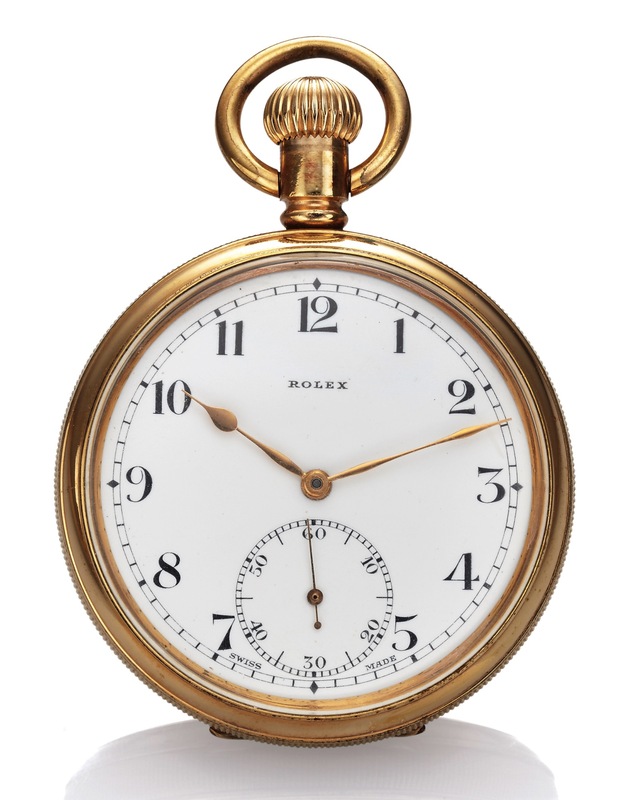 Fine and rare, gold-plated, keyless pocket watch with enamel dial. Four-body, bassine, polished, reeded band, engine-turned case back with blank cartouche, hinged cuvette engraved: English Make, This Case Guaranteed to Wear 10 Years . White enamel with Arabic numerals, outer minute track, subsidiary seconds dial. Gold spade hands. Cal. 18''', rhodium-plated, oeil-de-perdrix decoration, 17 jewels, straight-line lever escapement, cut bimetallic compensation balance, blued steel Breguet balance spring, micrometer regulator. C. Four-body, bassine, polished, reeded band, engine-turned case back with blank cartouche, hinged cuvette engraved: English Make, This Case Guaranteed to Wear 10 Years . D. White enamel with Arabic numerals, outer minute track, subsidiary seconds dial. Gold spade hands. M. Cal. 18''', rhodium-plated, oeil-de-perdrix decoration, 17 jewels, straight-line lever escapement, cut bimetallic compensation balance, blued steel Breguet balance spring, micrometer regulator.